At almost double the price of most 19-inch LCD TVs, the 58mm-deep TX-L19D28EP comes with high hopes and a carefully thought-out attack plan. Its chief weapon is probably its iPod dock, a sparkling white, wired cradle that clashes slightly with the TX-L19D28EP's standout feature: its purple finish. If you want to stretch the iPod association further, a white model is also on sale. 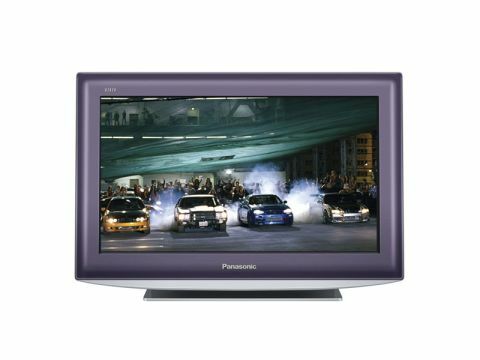 Here, a metallic, purple-tinted frame runs around the frame of the TV, lending the TV a certain class, but also indicating that this is one well-made product. And that's proved when we switch on the TX-L19D28EP. IPS-Alpha LCD panels were a huge step forward for liquid crystal displays a few years ago and the LED backlighting on this set moves things up another notch. Set to the out-of-the-box perfection that is its 'True Cinema' setting, the panel hosts pin-sharp hi-def pictures and Freeview images that are as colourful, clean as punchy as we've seen. Contrast is excellent, with black areas of the picture convincing and no distracting motion blur. The screen also has a much wider viewing angle than most, and though some contrast drains if you watch from the side, colours hold up. The TX-L19D28EP's iPod menu is another revelation. Panasonic's general TV interface can appear illogical, but it's at its best here. It gives you access to everything, from choosing preset playlists to hunting down video podcasts and photos. Video podcasts and movies stored on an iPod (or any model of iPhone) look fabulous on this small TV, while we found the menus quick to operate, aided by the usual high-quality Panasonic remote control. Connections are comprehensive with two HDMIs, though there's no USB slot – instead you'll find a SD Card slot that plays AVCHD, MP3 and JPEG files. There are a couple of downsides to this otherwise top-drawer TV. It should be no surprise that its 3W speakers don't do justice to movies or music, but the Freeview programme guide is an unexpected letdown. Activating the Guide+ EPG deadens the channel you're watching, with two hours of schedules for seven channels squeezed into the screen beside a huge banner advert. That aside, this is a rare attempt at a small TV of genuine quality; Panasonic has fitted the TX-L19D28EP with an impressive iPod interface and built it around one of the finest LCD panels we've ever seen at this size.